The increasingly effective sleuthing Roland Quandt has posted an interesting event invitation. What to make of it? You be the judge! 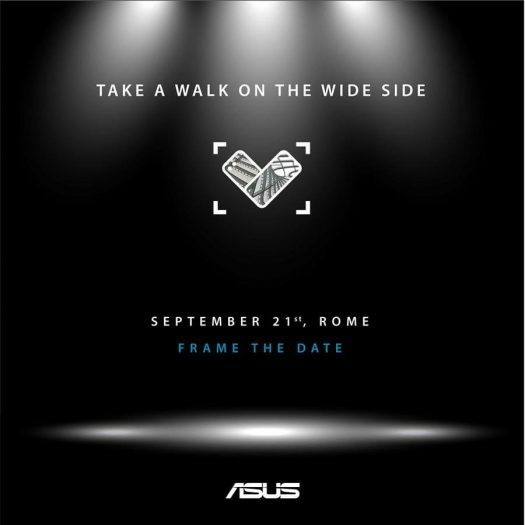 We have seen recent indicators (leaks) about a Zenfone 4V or simply Zenfone V. If you look at the one image in the center of the invitation it’s quite pronounced. Sure looks like a “V” to us! The frame around the “V” indicates a tracking feature of some sort. When it says, “frame the date” there is little left to the imagination. The first sentence “take a walk on the wide side” is open for discussion. That could mean a few things. Asus hasn’t shied away from doing the amazing or unexpected. The “wide side” could mean a smartphone with a new design feature. A two piece design, sliding out for example, is something which has been discussed or rumored by other companies.